Back in 1925, Scandinavian dairy tradition and inventiveness melded in the mind of Thor Bjørklund, a Norwegian furniture maker, to bring this simple-yet-effective tool to the world. Far better at obtaining even, consistent slices than knives, cheese lovers across the world discovered what they were missing out on over the following decades. Modern cheese slicers come in all shapes and colors and incorporate diverse improvements, yet manufacturers strive to maintain the usability and simplicity of the original design. Looking for a quality manual cheese slicer? Read on to discover the best ones on the market today. New York-based company OXO was conceived when Sam Farber noticed his wife’s everyday struggle with a vegetable peeler due to her arthritis. He set off to create a series of kitchen utensils that would be affordable, easy to use and more comfortable than those of competitors. OXO’s Good Grips brand embodies this philosophy at its best. True to the brand name, the Good Grips Wire Cheese Slicer model sports a handle made of a soft rubberized non-slip material with side fins around the middle for improved grip. The die-cast zinc body forms a sturdy C-shaped fork that supports a stainless steel roller and a tensioned wire. On the center of the slicer there is a thumbwheel mechanism that allows for easy adjustment of the tension of the slicing wire. This wire comes with ends that fit perfectly into the nooks on the outer side of the fork and on the side of the thumbwheel. If this matte black and shiny metal combination matches your kitchen decoration, you have the option to hang it upside down as a decoration thanks to an adequately sized hole on its handle. They say looks can kill, but OXO’s cheese slicer is as safe as a mother’s lap. The wire relies on pressure over sharpness to cut cheese, so your fingers will never be at risk. This makes removing the wire and putting it back a pretty straightforward, hazard-free procedure. The OXO cheese slicer is 100% dishwasher safe, but you want to make sure you loosen or remove the wire using the tensioning thumbwheel before putting it in there; this prevents it from losing its tightness too soon. Keep in mind, however, that washing it by hand with a bit of soap will only take a few extra seconds. You might be wondering by now, “What happens if the wire becomes too loose or breaks?” Well, this product comes with a replacement wire that is very easy to set up, effectively doubling the lifespan of your product. If more wires are needed, dirt-cheap packs of additional replacement wires are readily available for purchase. How’s that for convenience? Operation is as easy as it gets: loop the wire into position, adjust the tensioning wheel and off you go. It does what it is supposed to do, and does it well. The wire slides effortlessly into different kinds of cheese, obtaining perfect slices with flat surfaces and intact edges. Getting the desired thickness right can be tricky at first, as it depends on the angle at which the slicer is pushed against the cheese. It produces thick slices of up to 1/2″ thick, and you get thinner slices as you tilt the slicer toward a vertical position. 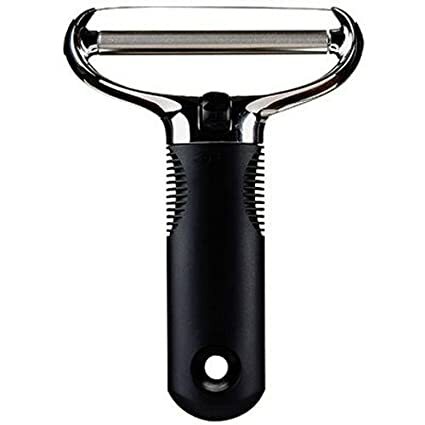 It is a simple manual skill, yet one that even might impress your guests when they fail at their first unprepared attempt to use this type of cheese slicer. This tool is wide enough to fit most standard cheese blocks, making simple preparations like grilled cheese even easier. Its design works best on medium to hard cheeses; while this might seem like an important limitation to consider, most sane individuals do not feel the need to use a slicer on cream cheese. Moreover, the roller mechanism is great at keeping sliced Parmesan or Cheddar out of the way slice after slice, but soft or creamier cheeses tend to stick to and break against it. This item has been designed and engineered in the US. Like most things nowadays, it is made in China, but the parent company stand by their product and offers a refund or replacement to any customer who happens to be less than satisfied. The OXO cheese slicer comes ready to use with a wire already set up on it. New units are shipped strapped to a piece of printed cardboard; a plastic protector covers the tensioning wheel and the bundled replacement wire is held in place by a plastic bubble. Although minimalist, this packaging solution is effective and ensures the slicer will arrive to your hands in mint condition. Our gold pick brings the best value for the money to your table. OXO’s Good Grips Wire Cheese Slicer with Replaceable Wires is surprisingly affordable yet features sleek design and performance coupled with a no-frills approach to slicing, making it an ideal solution for most users. With a completely different and versatile approach to cheese slicing, the Westmark Cheese Slicer with Stainless Steel Blade and Board is a close runner-up. Germans do not mess around when it comes to the quality of their manufacturing and engineering. This is particularly true of a company that takes great pride in the honed skills of its lifetime employees, as is the case of Westmark. 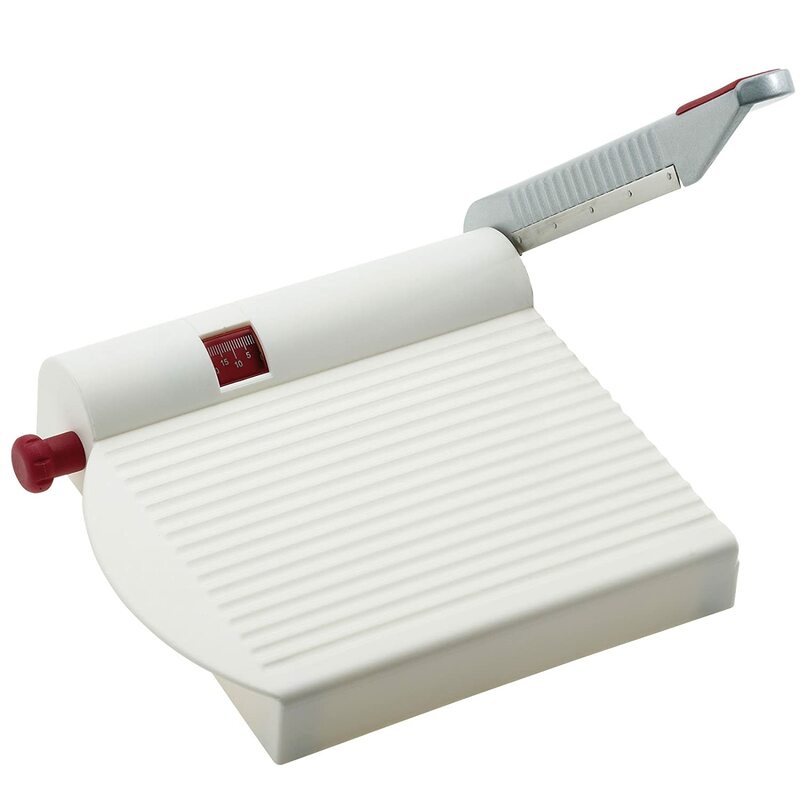 Nicknamed “Fromarex”, perhaps by an employee daydreaming about a T-Rex mercilessly slashing a wheel of fromage with his tiny arms, this slicer features a board-mounted design with guillotine, akin to a paper cutter. The sharp blade is made from high-grade stainless steel with a powder coated aluminum handle. A resistant and easy-to-clean white plastic material makes up the board, which measures slightly over 9” on each side; board size is enough to accommodate larger blocks of cheese and to facilitate food handling. Opposite the blade, the board protrudes in a semicircle that acts as a safe handle for the whole unit. The Westmark cheese slicer also features an embedded scale for slice thickness adjustment, which can be pushed or pulled to set the desired thickness. This latter characteristic is a welcome addition that sets it apart from its competitors. Overall, this slicer boasts a solid, simple and practical design in a clean and attractive color combination. The simplicity of its design makes its performance flawless and fun. From 1/8” slices to splitting foot-long cheese blocks, it is the right tool for the job. One of the main advantages of this cheese slicer is that it can also be used for slicing vegetables and other foods without any issues – Beheading lettuce and skinning garlic has never been easier! This is a great feature for lovers of salads and cured meats or for people who prefer fewer but more useful gadgets in their kitchen. Just think, you can construct an entire, elaborate cheese plate with a single tool. The bladed design of this cheese slicer makes it suitable for a broad range of cheeses, from soft Neufchatel to hard Pecorino. Moreover, the slice thickness scale and large board facilitate consistent slicing at a faster pace than using a standard manual cheese slicer, especially with harder cheeses and foods. But it is the little things that count: detail-oriented design by Westmark has resulted in slices falling on top of each other during continuous slicing, thanks in part to the non-stick aluminum covering of the blade with a grooved pattern on the inner part. As with other bladed tools in a kitchen, basic precautions should suffice to prevent accidents. 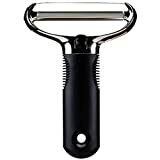 The semicircular handle and large size of the Westmark cheese slicer allow for calculated movements during slicing, and ensure that the blade has no possibility of coming into contact with skin when closed. This item is rated dishwasher safe; nonetheless, as with most sharp tools, you can help preserve its edge for longer by washing it in the sink with mild soap and lukewarm water. Westmark includes a 5-year warranty with this German-made product, implying that the flimsy-looking plastic board is a lot tougher than it may seem. Although the size and aesthetics of this particular cheese slicer might not find a place in every kitchen, there is no doubt that it is a high-quality, versatile option that also works on vegetables and cold cuts, resulting in great value at only a slightly higher price. The Barmix brand of Florida-based company Attican presents this stainless steel slicer. With no moving parts or replaceable pieces, it is an adaptation of the tried and true 1925 design by Thor Bjørklund. Reliability and design have earned this product the third place in our list. This back-to-basics design features a stainless steel body with a rubberized handle and a hole for hanging on the wall. 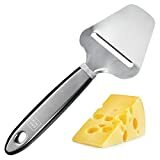 At 8” long, the Barmix Stainless Steel Cutter is a full-sized specialized cheese slicer with a flat end and a sharp blade that slices cheese evenly and easily. Most of the weight is centered on the handle in such a way that, when put down, the handle touches the surface while the flat end remains in the air. This is a great feature for preventing secondary contact of food with other surfaces. The Barmix cheese slicer is recommended for medium to hard cheeses. The flat end acts as a guide and stabilizes the depth of the blade, resulting in consistent slices of a thin width being extracted with minimal effort. The width of the slices is limited to the width of the blade opening, about 1-1/2”. The flat spatula-like end acts as a receiver of slices, but it can also be used for other tasks such as serving pie. Sharpness and the position of the blade make it possible to also use this tool to peel certain vegetables with ease. Both of these features make it more versatile than intended by the maker, and has helped it rack up extra points among customers who appreciate the added value. The blade, while sharp enough to slice the hardest of cheeses, does not pose a significant hazard for the user due to its position. The Barmix cheese slicer is completely dishwasher safe, although there have been reports of rust appearing after several dishwasher cycles. Avoid this and prolong the sharp edge of your blade by hand washing your cheese slicer. A lifetime warranty and a 100% satisfaction guarantee backed by a money-back offer shows the trust placed in this product by its manufacturer Attican, a great addition to an already affordable cheese slicer option. Packaging is simple: product comes attached to a carton ready for hanging display, since no additional protection is required for a stainless steel kitchen tool. Barmix’s slicer design is visually attractive regardless of the occasion and it is not likely to fail unexpectedly; reliability has been the major driving factor behind the popularity of its design. Under normal circumstances, this tool should last for many years to come completely free of rust and bends. An American company with Scandinavian roots, Norpro has been making outstanding kitchenware since the 1970s. We would like to give the budget pick to their Norpro 330 Heavy Duty Adjustable Cheese Slicer, a feature-rich product that some people might find more attractive than our top 3 picks. At 5” x 5”, this moderately sized handheld wire cheese slicer does not need to show off. Humble in appearance, its heavy-duty zinc alloy body free of unnecessary embellishment, the Norpro 330 incorporates a mechanism that adjusts the thickness of the slice via brass screws on each side of the tool. This allows for fast and consistent cheese slicing without worrying about the angle or cutting yourself, since the wire is not sharp. This is a very sought after feature in wire cheese slicers but not commonly implemented by manufacturers. This model is adequate for smaller pieces of medium-soft to medium-hard cheeses. Wide enough to accommodate most cheese blocks, the Norpro 330 is the perfect tool for unpretentious cheese lovers. From cheese-laden sandwiches for dinner to boards of ultra-thin cheeses at a gathering, this adjustable cheese slicer can get the job done. In this model it is possible to replace the slicing wire when tension becomes irreversibly loose. This is great, but what is even better is that the replacement comes included in your original purchase! The procedure is quite simple and only involves removing the screws that hold the wire in place. As with most cheese slicers, slicing wire tends to deteriorate in the dishwasher. Norpro specifically recommends hand washing this product for an extended lifespan. This leads us to our last point: despite overwhelmingly positive product reviews, information on Norpro warranties is difficult to find. Contact your dealer directly in case any problems with your Norpro cheese slicer arise. The Norpro 330 Heavy Duty Adjustable Cheese Slicer is a great alternative to our top 3 picks, but the final decision should be made according to your needs. Keep reading to find out what to consider when acquiring a cheese slicer and what type of slicer is the best for you. Everyday tool or ceremonial item? Most cheese slicers come in one of two basic designs, each with its own innate advantages and disadvantages: a standalone hand tool or board-mounted devices. The former follows the original 1925 design that made the cheese slicer so popular; as with most old-school designs, it focuses on ease-of-use and durability over anything else, perfect for your everyday grilled cheese. More formal occasions might benefit from a board-mounted design: base boards are available in materials such as classic wood or luxurious marble and help keep slicing a mess-free operation. Blade slicers are versatile tools that can also be used to slice vegetables and other foods. Their performance depends on the sharpness of the blade’s edge, which usually lasts for a long time. This makes safety a big concern, so keep an eye out as they can also perform a number on your fingers if you are not careful! Wire slicers are specialized tools that are easy and safe to operate. The downside here is that cheese wires tend to lose tension or even break more often than blades require sharpening. Some manufacturers offer easy-to-install wire replacements for their products, sometimes bundled in with the purchase. As noted above, replacement wires are also easy to come by and very cheap. As with anything, personal preferences come into account. What is your favorite cheese? Do you like thin slices or thick chunks? While most slicers work great on a wide variety of cheeses, some work best on that creamy wheel of Brie and others make the perfect slice of cheddar for a sandwich. Wire and roller designs are great for thin and even slicing of most cheeses around the middle of the hardness spectrum, while classic handheld blade designs are versatile and suitable for exploring the tough realm of hard cheeses. The board-mounted wire designs, also called cheese cutters, work best on softer cheeses such as Camembert and Munster. Cheese slicer blades and wires are almost invariably made of stainless steel, but the handles and base boards come in a variety of different materials. It’s up to you whether you want to choose a firm rubberized grip or a clean metallic handle. As for base boards, wood looks beautiful but it might be harder to clean thoroughly, especially when compared to marble or other non-porous materials. Most slicers are dishwasher safe. Nonetheless, machine washing tends to shorten the life of stainless steel wires used in cheese slicers. Though you can loosen or remove the wire before putting it in the dishwasher, most cheese slicers are a breeze to clean with a little soap and water. Hand washing your cheese slicer will help maintain your slicer’s blade sharp or, in the case of wire slicers, prolong the life and tension of your cutting wire. There are few things more satisfying than getting a perfect slice of the right cheese on your favorite food. Whether you like pampering guests or you are on a personal quest for the perfect sandwich, you need the right tool for the job. The information provided here will enable you to make an informed choice between the top items in this category, according to your needs. We have selected the best of the best to make your life easier. Fly, little grasshopper, fly! Make a wise decision and enjoy the essence of dairy the in the best way possible.